With the biggest beds we’ve ever seen in a hotel, and a rooftop pool to boot, Tirant Hotel in Hanoi’s Old Quarter is a modern yet characterful mid-luxury option. The impressive facade looks somewhat out of place on Old Quarter’s narrow streets and the decor doesn’t disappoint in the luxe stakes either: chandeliers, leather chairs, heaps of marble and gold await in reception. 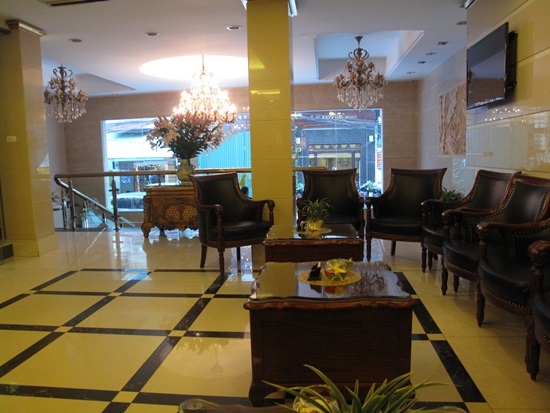 The hotel has 63 rooms spread over nine floors and in five room categories: classic, deluxe, premier, executive and suite. We were first shown the classic and it has to be the most spacious and well-equipped ‘standard’ room we’ve seen outside of the five-star hotels. Not only does it have the usual minibar, safe and monogrammed slippers, but it also comes with robes, a computer, an alarm clock and bathroom scales. The staff member showing us round took pains to explain that both the minibar and alarm clock were very quiet – though hopefully not when you want to be woken up. On my, that’s a big bed. The classic and deluxe rooms are identical but for the windows; the former has just a small slit window whereas the deluxe has a larger one. Bathrooms in all rooms have walls of frosted glass – cheaper than bricks? 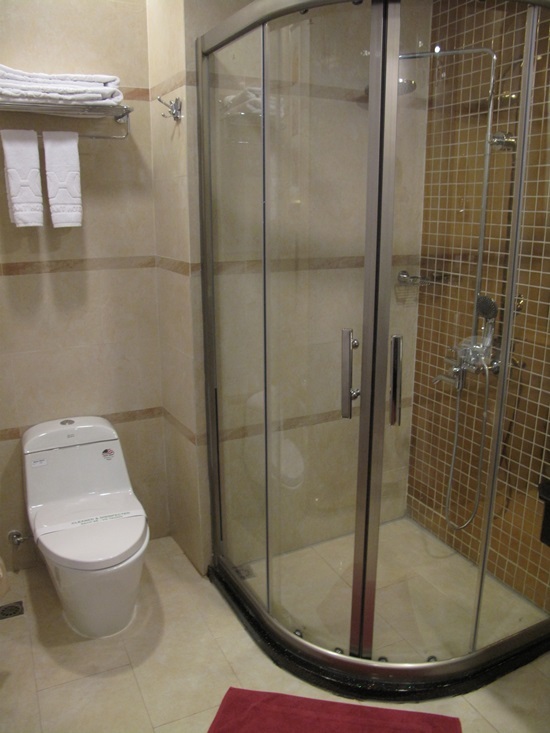 — and are well fitted out with a large shower cubicle, modern fittings and quality towels. Some of the more subtle use of gold. The premier and executive rooms are a step up in size — the executive has more windows — and the suite has a partition between the bed and a small area with sofa, coffee table and TV. It’s not actually much larger than the executive room – and the bed is a standard king size – but does have a bath tub, for those who like their soaks, and a good sized balcony with lake view. Note, however, that the view is partly obstructed from some of the rooms. It’s not how you spell it but how you say it that counts. The Tirant is one of the only hotels in Old Quarter with a pool, although unfortunately on our visit it was closed due to construction work. It’s on the roof, so we’re guessing the views are worth a visit up there alone. It also has a tiny gym, with running machine, weights machine and one unidentified machine, and a lounge bar on the ninth floor (which was also closed due to the construction but due to re-open in September 2013). Staff were professional and welcoming — we were even served tea in reception when caught by a rainy downpour. 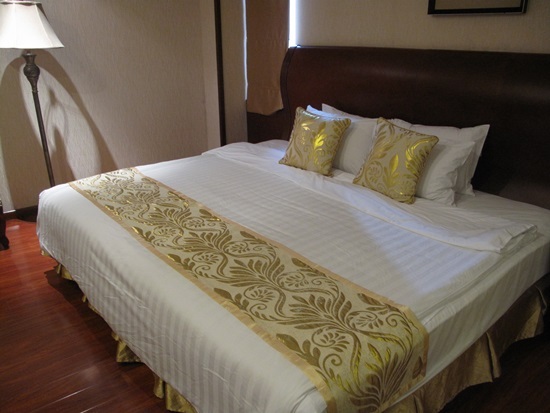 Rack rates quoted are on the high side, but if you can get an online deal it places the hotel alongside the likes of Church Boutique on Nha Tho and the Golden Lotus Hotel and it compares favourably. 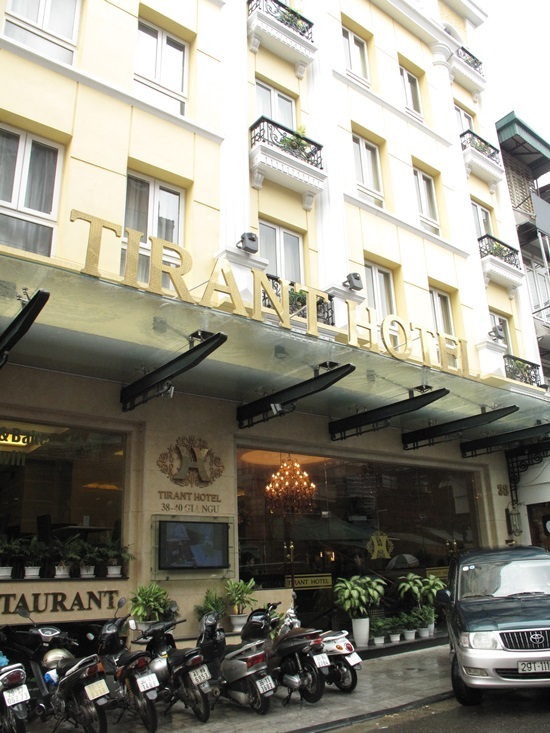 Tirant Hotel is located on Gia Ngu near the junction of Dinh Liet Street, and slap bang in the heart of Old Quarter. 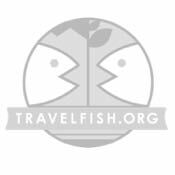 It’s within a five-minute walk of Hoan Kiem lake and near to some good street food options and Western restaurants.